This entry was posted in Fashion, Inspiration, Uncategorized and tagged Dree Hemingway, Inspiration, Vogue UK by Carolina Engman. Bookmark the permalink. Wow, I love this. UK vogue is so much more interesting than US I think. i agree UK is much more focused on fashion than teh US one In my opinion. I constantly find myself writing more on European designers than AMerican ones because they are crazy creative. wow. those legs go on forever – isn’t she gorgeous! 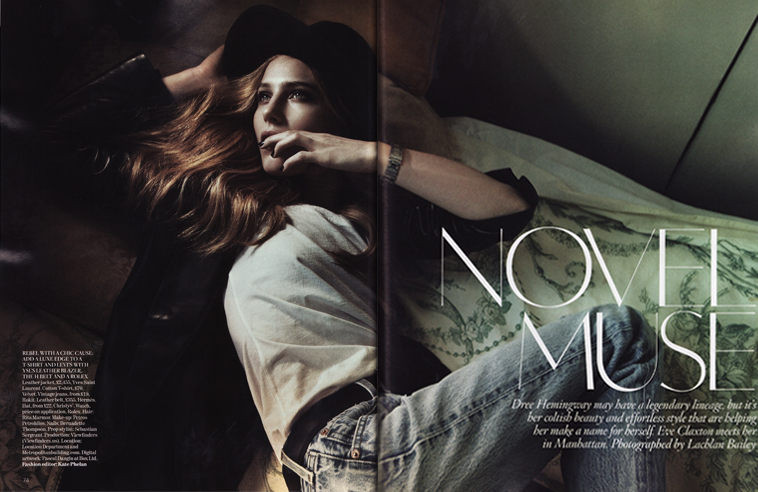 Very nice editorial… and she is so beautiful! skinny skinny skynni legs! the pic’s are amazing! What a beautiful shoot! The light is incredible. When I saw these just now I really asked myself: Wow, who is she? No wonder she’s considered a “novel muse”. again, she’s a complete anerectic!! !